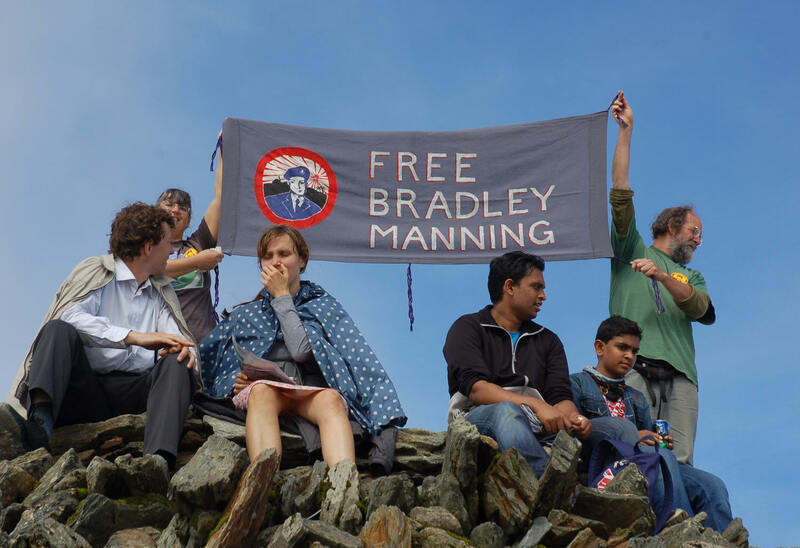 See also press release, this article about the anniversary, the call-out on bradleymanning.org and Kevin Gosztola’s article reviewing the Diaries. 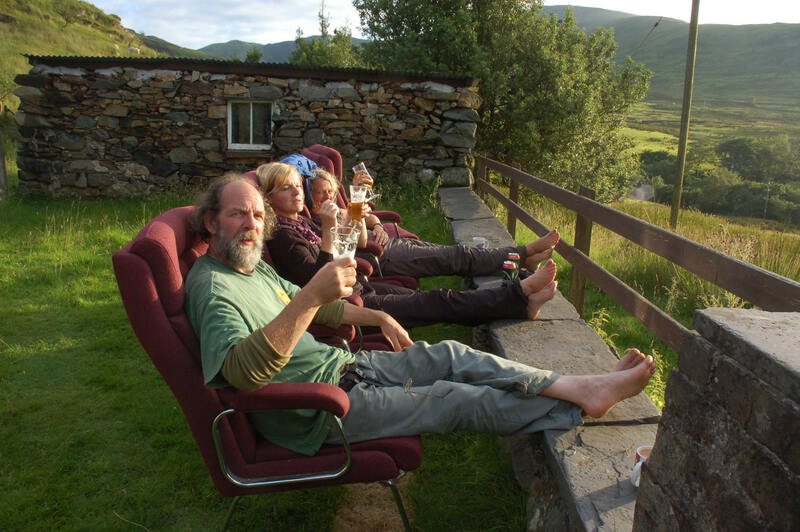 On 1 August, the Western Telegraph (Pembrokeshire paper) printed this article, but didn’t use any of the photos they’d asked for and I had sent, just the standard one of Brad that gets used everywhere, nor did they mention WISE Up. 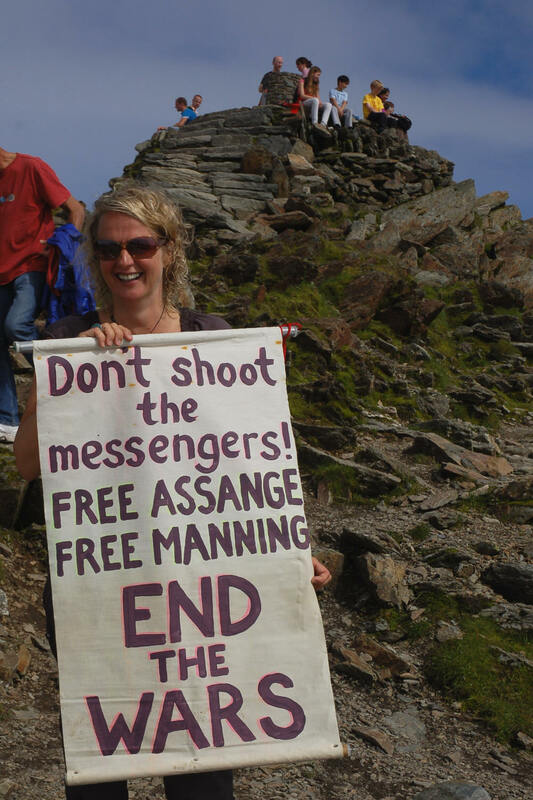 Exactly two years after the WikiLeaks release of the Afghan War Diaries, Wednesday 25 July 2012, banners were unfurled at the summit of Snowdon to mark the anniversary. 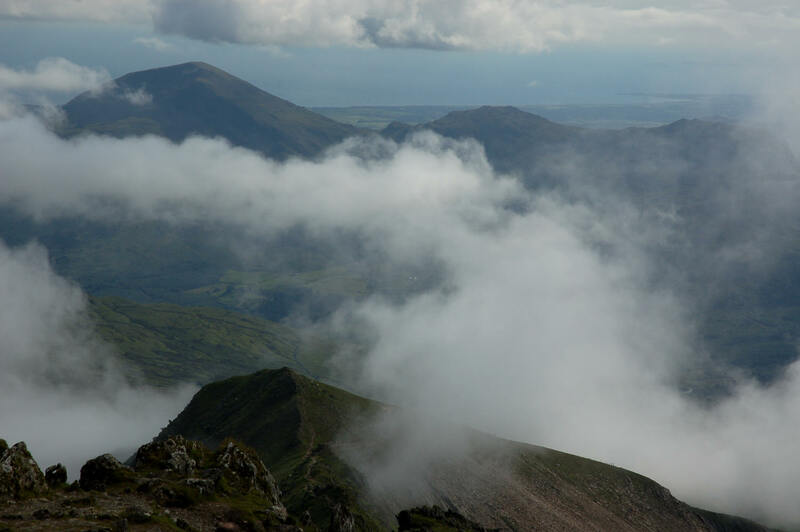 The highest mountain in England and Wales, Snowdon rises some 1,000 metres above sea level. 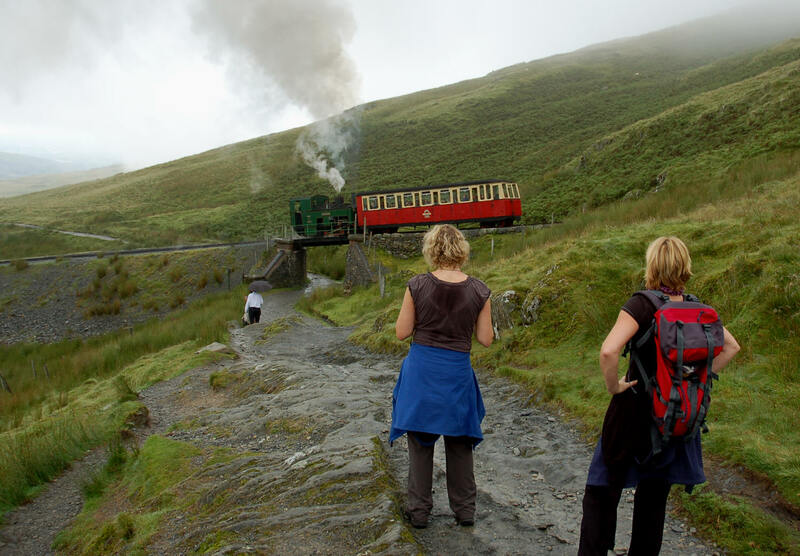 Reaching the summit via the Llanberis path entails a climb of almost 900 metres with the mountain railway running within sight of the path for most of the ascent, allowing passengers to wave cheerily at those plodding along on foot. 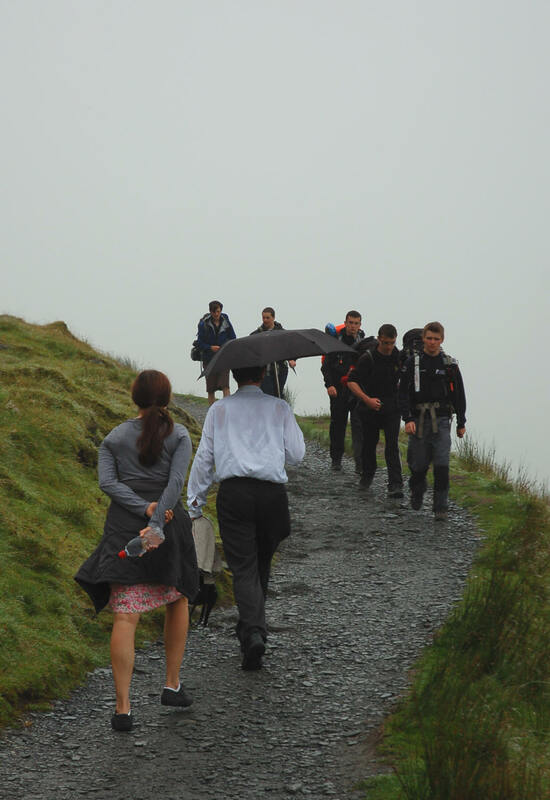 The weather conditions were muggy and windless on Wednesday as we sweated our way up the mountain from Pen Ceunant Uchaf above Llanberis just after lunch. 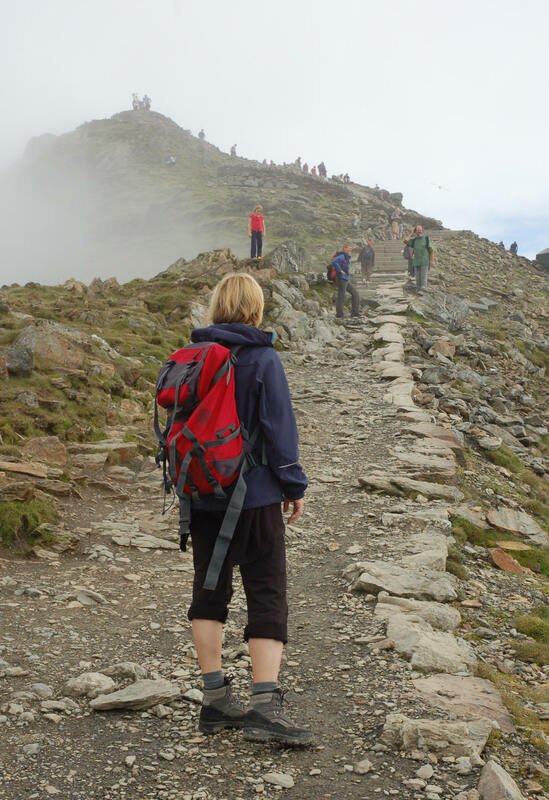 We encountered fog, low cloud, drizzle and many fellow walkers heading in both directions as we slowly gained height. 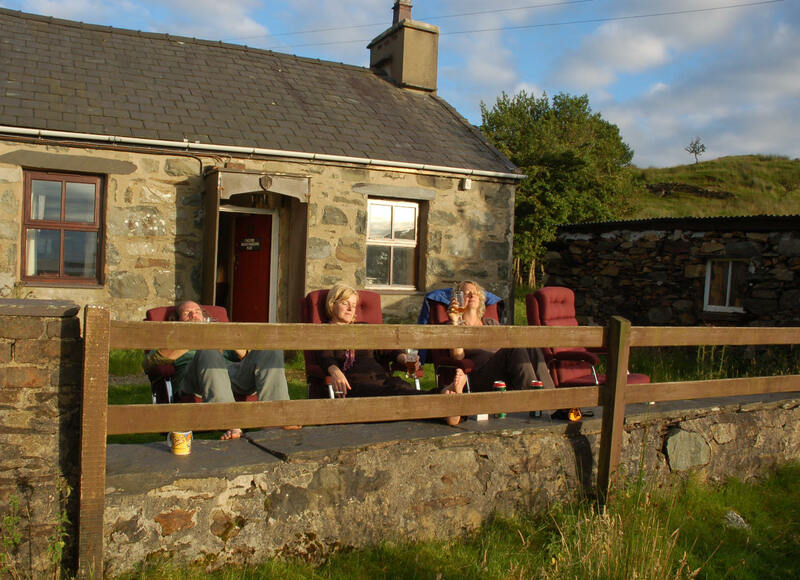 …and we emerged into glorious sunshine and crowds of tourists who had arrived via the mountain railway as well as a smaller number of hillwalkers who had got there under their own steam. and “DON’T SHOOT THE MESSENGERS! FREE ASSANGE. FREE MANNING. END THE WARS”. 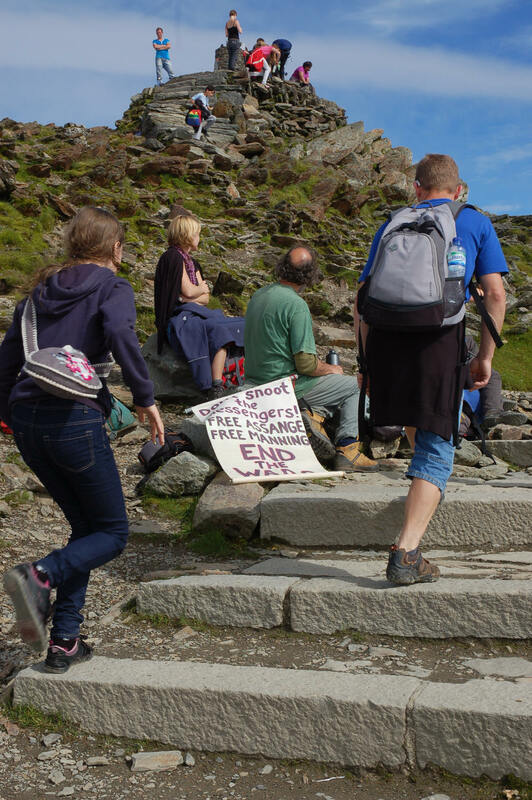 We handed out stickers and answered questions about the action, then rested in the sunshine just below the summit to prepare ourselves for the return journey. We took this action to remember all those killed, maimed, traumatised and bereaved in this futile war and to stand in solidarity with all those who have had the courage to resist and speak out. 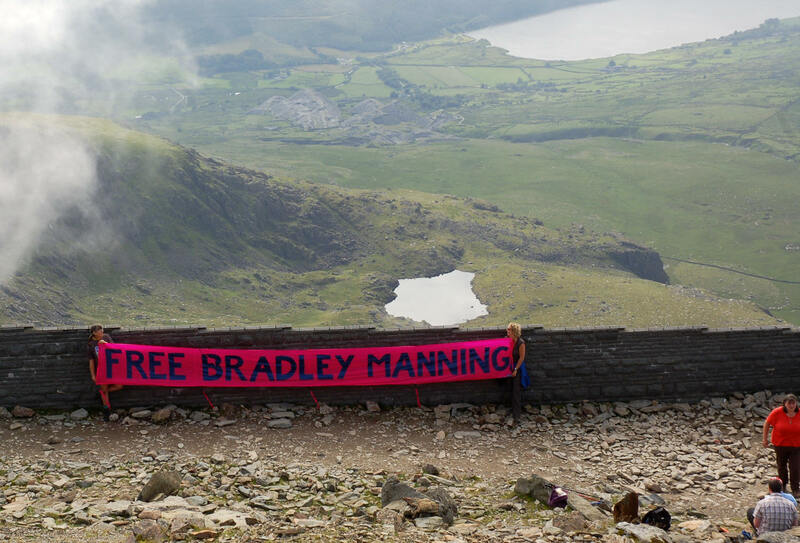 As we stood on the summit – the highest point in England and Wales – looking out across the landscape, our thoughts were, in particular, with accused whistleblower Bradley Manning who has Welsh roots and who has been held for two years in pretrial detention, who has been denied his rights and subjected to torture at the hands of the US; with WikiLeaks’ Julian Assange who has sought refuge in the Ecuadorian Embassy in London in fear of his life if extradited to the US either from Britain or Sweden; with Michael Lyons, the British Navy medic who was jailed last year for resisting the war in Afghanistan having studied the Afghan War Diaries. 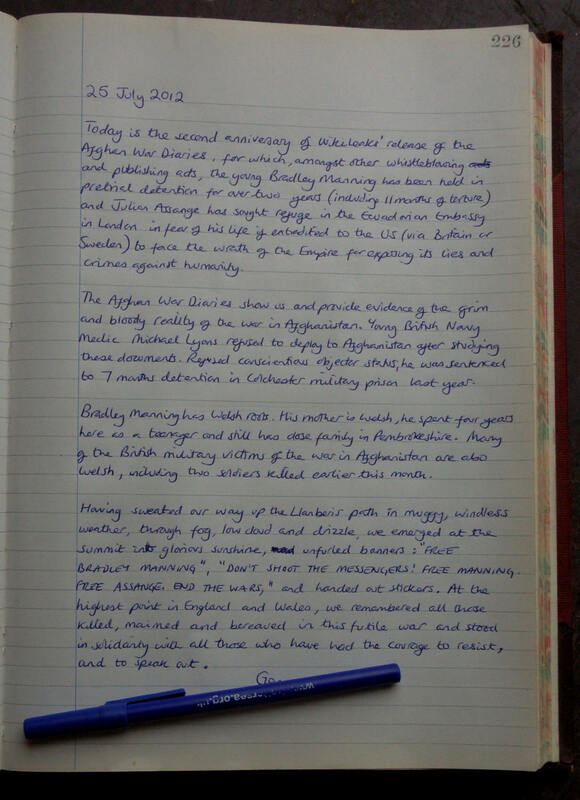 and wrote an entry in the log book to inform other hut users about the action. More photos here. Also see this indymedia report. 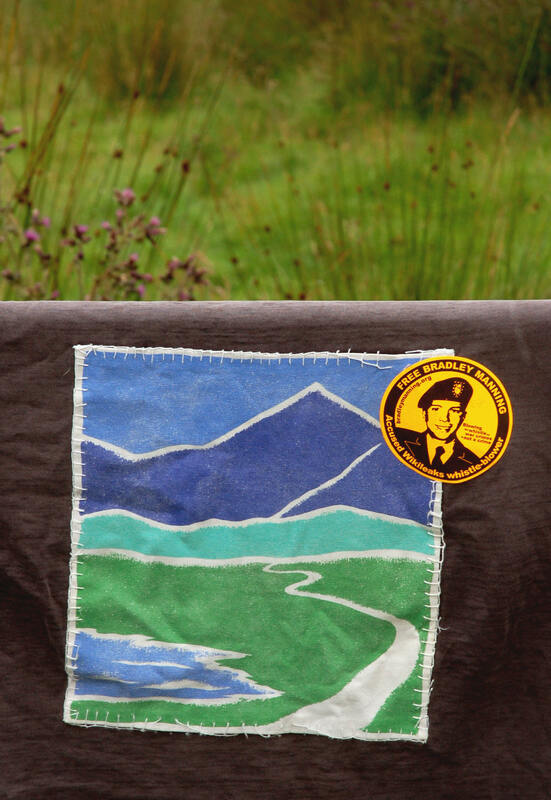 Gallery | This entry was posted in Assange, Lyons, Manning, Reports and tagged anti-militarism, anti-war, banners, Bradley Manning, Britain, Julian Assange, Michael Lyons, Snowdon, solidarity, Wales, WikiLeaks, WISE Up, Wrexham. Bookmark the permalink.